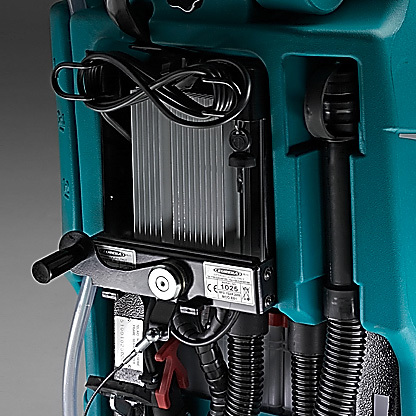 The E71 is a professional walk-behind scrubber-dryer which, equipped with the innovate Eureka ECOsystem®, guarantees impressive labour, water and detergent saving and boasts a productivity rate three times greater than traditional systems. 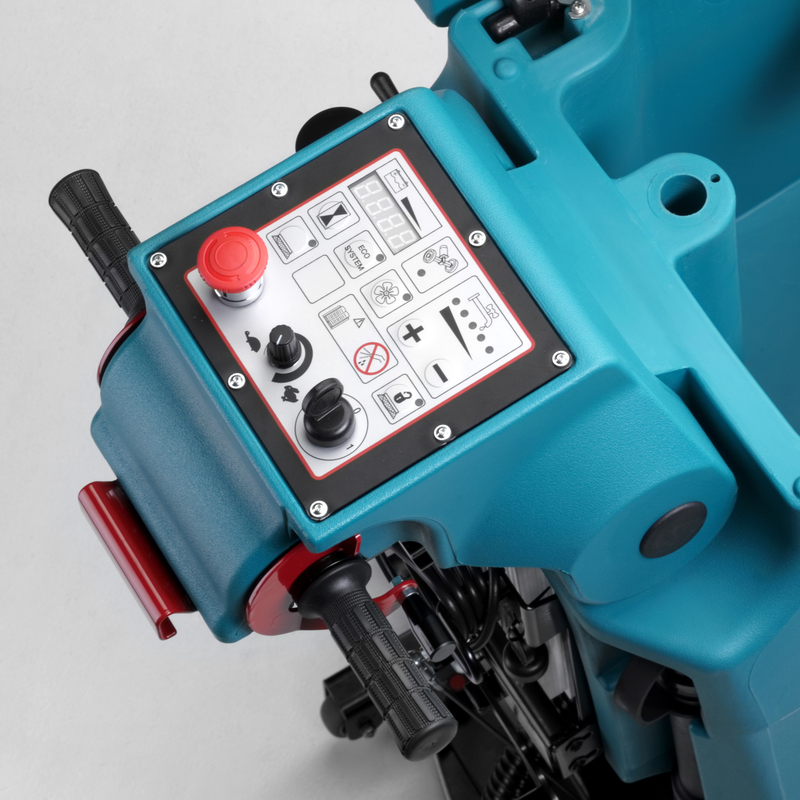 WHICH MODELS ARE AVAILABLE FOR THE E71 SCRUBBER-DRYER? The E71 scrubber-dryer is available in M, TRAC or ECO configuration. The top of the range ECOsystem® is an innovative method to recycle water and detergent, saving time and money whilst increasing productivity. The TRAC M (Mechanical) version has been designed in order to be the most intuitive easy-to-use scrubber-dryer with low maintenance costs. 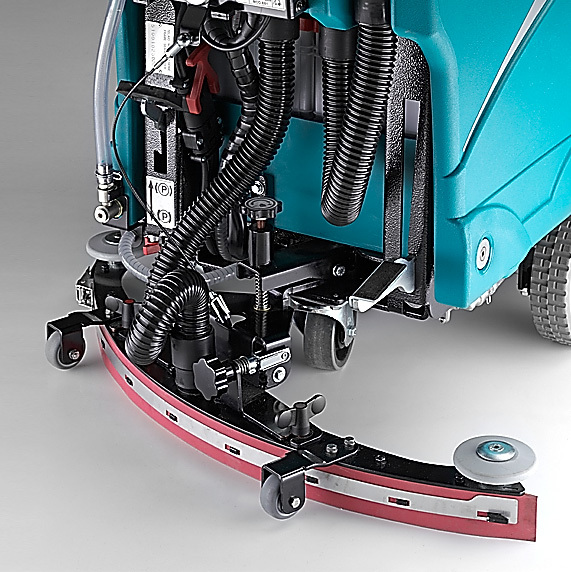 The TRAC TRONIC version is fitted with full features, including; the innovative Brush'O-Matic® system which automatically engages or disengages the brush for rapid hands-free replacement, the vacuum-motor delayed shutdown avoiding left behind streaks of the floor, and the intuitive multi-function display. WHAT IS THE ECO-SYSTEM IN E71 SCRUBBER-DRYER? The exclusive system designed entirely by Eureka S.p.A. recycles water and chemical and guarantees solution, labour and cost savings whilst reducing the environmental impact of cleaning. After the first pass around 60% of chemical remains active, the ECOsystem® reuses this solution therefore maximising its cleaning potential. 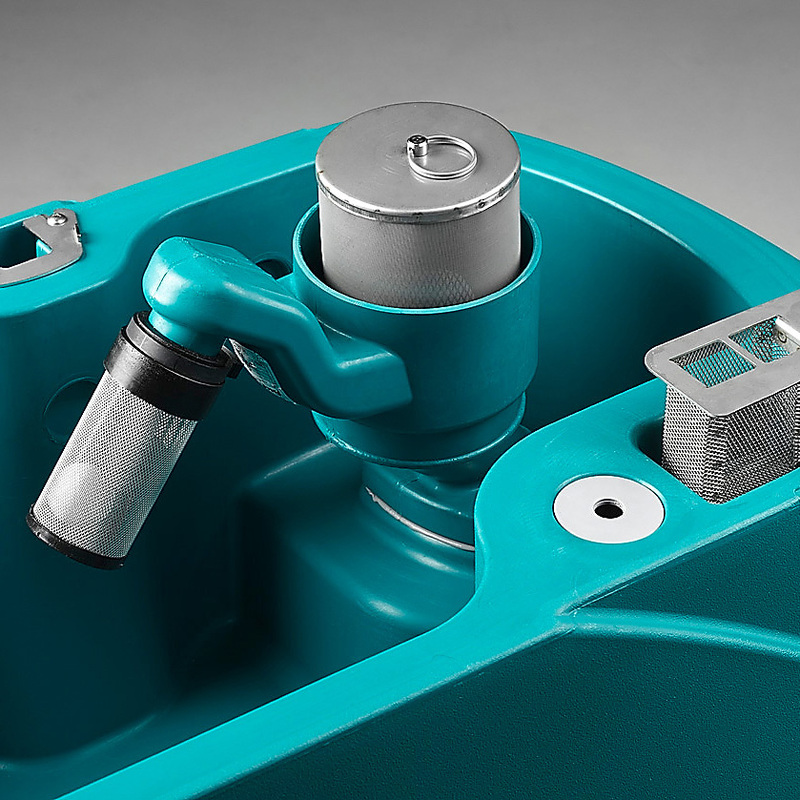 This means the operator spends less time emptying and refilling, increasing overall up time. WHY IS E71 ROBUST & RELIABLE? The E71 scrubber-dryer structure is entirely manufactured in Eureka in order to ensure the highest qualitative standards. Its robust steel frame is treated with zinc phosphate and finally painted with cataphoresis system in order to preserve the material characteristics & proprieties over time, increasing overall resistance. HOW TO CHANGE E71 SCRUBBER-DRYER BRUSH? Eureka has created the innovative Brush'O-Matic® system which automatically engages and disengages the brush pad for rapid tool-free replacement. HOW TO ADJUST THE E71 SCRUBBER-DRYER SOLUTIONFLOW WHILE CLEANING? The E71 scrubber-dryer TRAC TRONIC and ECO versions have a solution flow control function, which can be adjusted according to floor conditions. Via the intuitive display panel the operator can choose from the lowest level (1) up to the highest level (5) using “+” or "-" buttons, level 5 enables a solution flow amount of 5.3 liters/min, the level of solution is indicated on the display. WHAT IS THE E71 SCRUBBER-DRYER CLEANING CAPACITY? 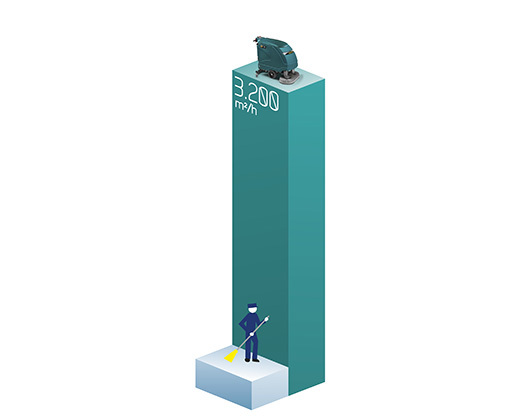 The E71 cleaning capacity is 3.200 m²/h thanks to a cleaning path of 710 mm and a forward speed of 4 km/h. 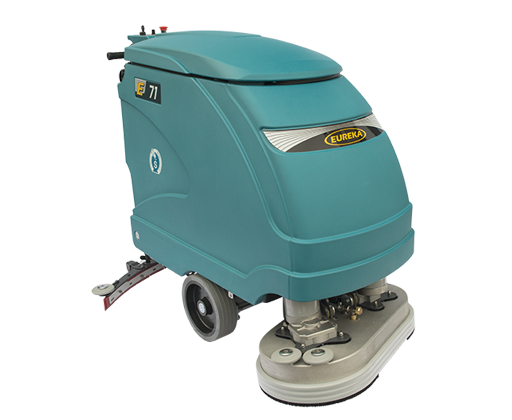 Designed around Eureka's ECOsystem® technology, the E71 is a professional walk-behind scrubber-dryer, ideal for the thorough cleaning of medium to large areas. The twin brush scrub deck has a cleaning path of 710 mm which, combined with a 4,5 km/h speed, boasts an area coverage of 3.200 m2/h. Available in M, TRAC and top of the range ECO versions. The exclusive ECOsystem® uses a unique method to recycle water and cleaning detergent, therefore increasing productivity and decreasing time wasted emptying and refilling. This reduces the quantities of cleaning detergent and water required, guaranteeing both cost and labour savings. The tough steel frame is treated with zinc phosphate and coated with thermo-hardened paint for extra durability. 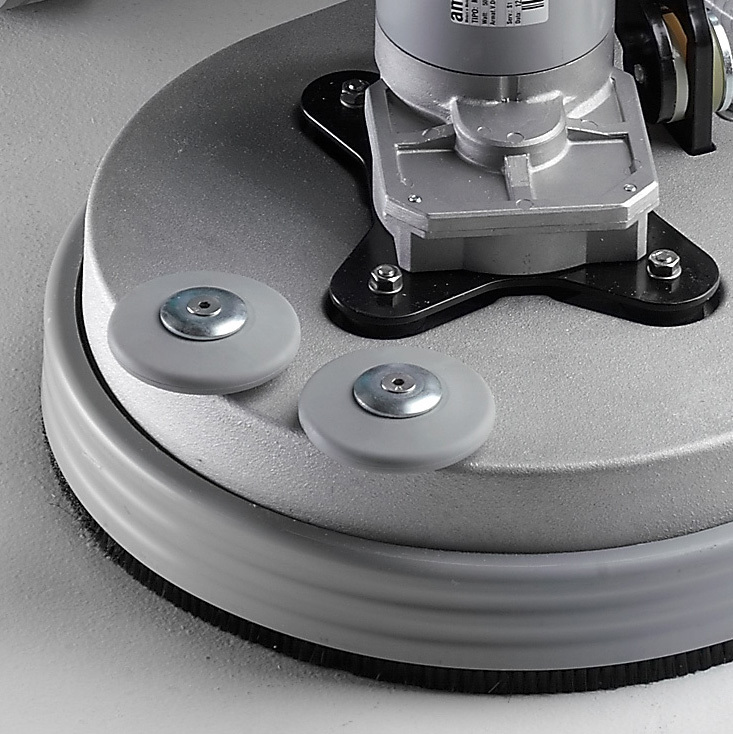 Protects the vacuum-motor against dust/debris to ensure more durability and longer life. Multi-fuction display with intuitive controls. Quick, safe and simple battery charging with the on-board charger, available as standard on all models. Die-cast aluminium brush head, reinforced for extra resistance and fitted with a self-leveling splash-guard. The parabolic design of the steel squeegee and powerful vacuum motor guarantee maximum water pick up, delivering clean, dry floors in a single pass. The E71 is one of the models in the Eureka scrubber-dryer series also available in Chrome, with frame and exposed components in stainless steel. 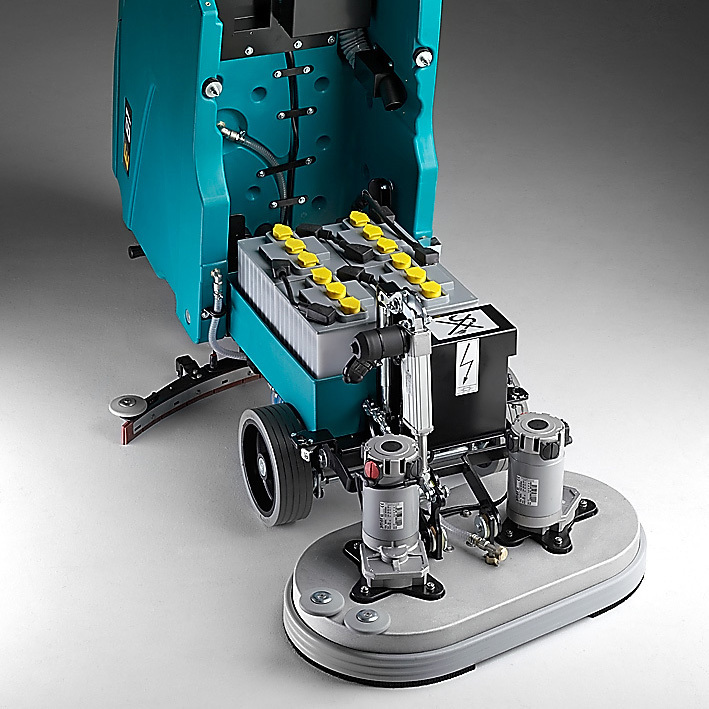 This machine is ideal for cleaning in corrosive contexts or with particularly aggressive detergents. Water saving technologies like the ECOsystem® qualify Eureka scrubber-dryers to be recognized and published on the Water Technology List in the UK. Industrial sites, communities and vicinities, schools, offices, religious buildings, hospitals, public buildings, airports, ports, shopping malls, logistical depots, cleaning companies, and multi services. Ceramics, marble, cement/concrete, linoleum, non-slip surfaces, porcelain tiling, and many other dirty conditions. Whether you are looking for a professional sweeper, scrubber, an escalator&travelator cleaner or a combined ride-on sweeper / scrubber-dryer, Eureka has the right machine for you! Please fill out the following form with the required details, then press the "submit" button.